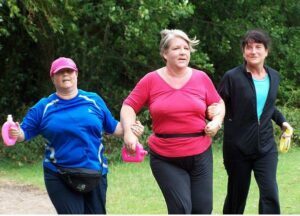 The data from Sport England’s Active People Survey suggest that Karen is not alone in taking up running in her fifties. In the nine years since the annual survey started in 2005/6 the women’s age groups with the highest percentage increases are 45 to 54, and 55 to 64. In both these groups participation has more than doubled (with increases of 152% and 163%). It seems likely that some of this increase is attributable to new runners like Karen. I first met Karen at Colwick parkrun, and we frequently meet at races in and around Nottingham. 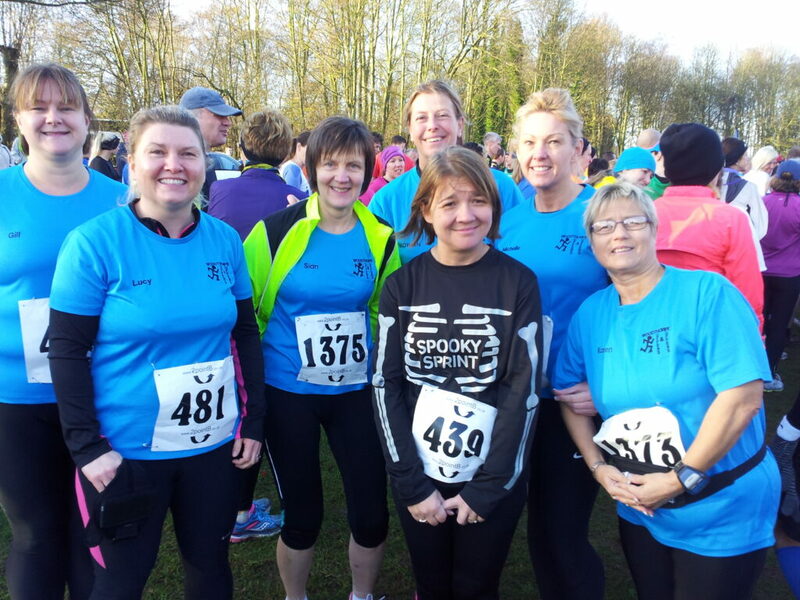 In 2014 Karen kindly arranged for me to go and visit her running club, Woodthorpe Huffers and Puffers. I wrote about that visit under the title “A club where no-one gets left behind”. 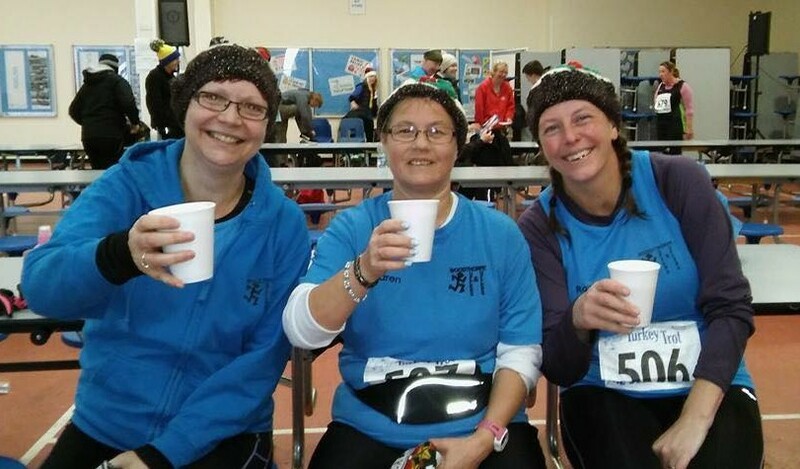 I went back to the club again on 24th February 2016 to interview Karen after first joining in the Wednesday evening run. I was curious to find out more about how Karen came to start running, and the role she has played in helping many other people learn to run. I started April 2010. I’d just turned 50. I saw a poster for a Learn2Run for 10 weeks, so I thought, “I’ll try that.” because I had put quite a bit of weight on and I’d got to do something to get rid of it. I joined the second week in, but by the end of the 8th week I felt confident enough to do at least two miles. It was one of the best things I ever did. We’d run for a minute, walk for a minute, and then the following week it would be up to two minutes. Gradually build up over the 10 weeks, and by the end of the 10 weeks we should be able to run two miles. By the eight week I could run it, very slowly, but I could run. (The course) was run by Woodthorpe Huffers and Puffers so that was how I got involved with the club. So what was it that got you confident about running? What happened after you’d completed the course? I stayed with the club. We’d run socially all together twice a week, Mondays and Wednesdays, as we still do now. And then I got talking to Cathy, and she asked if I would like to do a race. I said, “I don’t think I’ll be able to that.” and she said she was sure I would. 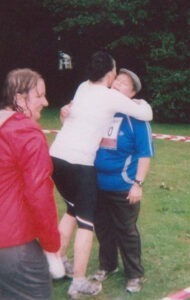 So we did a 5k run, the Sherwood Pines in July 2010. I’ll never forget it. It was horrendous. It was chucking it down with rain, absolutely freezing, and it was quite undulating, and it was muddy. We ended up walking most of it. We had a good laugh while we were doing it. We were the last ones in. The amount of support when we finally did cross the finish line, you can imagine. It was nice that they’d stayed. After that I wanted to run more and more. And I started going out on my own as well as with the club. So it was the experience of racing that really made a big difference to you? Yes, it made it a challenge rather than just running for fun. I thought, “I need something to keep me going, something to spur me on, because anybody can just run in a group.” I needed something more to get me out of the house more. You were already enjoying the social aspect of running but you had this motivation of wanting to do more for yourself. What happened after that first race? I did the Goose Fair Gallop 10k in October that year. It was a bit better because I’d done a bit more running. I did enjoy it. Then that was it, I was hooked! Any race that was going I would do it. I set myself a target to do the Great North Run (half marathon). I’d seen it on the telly. I thought, “I want to do it. I’m going to set meself up.” So I got in with Cathy, she helped me a lot. We went out and did the extra runs, and I finally did it in 2012. Did you manage to get a place in the ballot? Yes, the first time I got in on a ballot place. I’ve done it again a couple of times with charity places, and I’ve actually got in again this year on the ballot. What was it like doing the Great North Run? It’s a huge race isn’t it? The atmosphere was amazing and the support by the people in the towns. You got children going along high fiving you. When I got (to the finish line) I could have just stood there and cried, it was so emotional. I was there on my own. I’d gone up and stayed with Cathy, she’d moved back up to Northumbria. I stayed at her house, but she couldn’t do the run with me. I did the run on my own and then I came back on the train mixing with other runners who were travelling from Newcastle to Manchester and then from Manchester back to Nottingham. Was it a huge personal achievement doing that half marathon? Within two years (of starting running), yes. I never thought I would ever do it. It took me just under three hours, which was pretty amazing for me. Did it feel daunting doing it on your own? I felt okay because there’s other runners there that have come from all over the country. They’ve travelled on their own. I saw one or two faces that I knew. 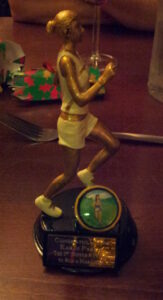 I did quite a few (races) that year, mostly 10ks. I did the Robin Hood Half Marathon in 2013. I’ve done that 3 or 4 times now. And I’ve done the full (marathon) once. I’d never thought I would run as much as I have. I’ve just enjoyed it so much. When did you start getting really involved in the club? Did you do sport when you were younger? I started getting health problems. I started with asthma and things like that. Is the running going back to some of the same feelings and experiences you had when you were younger? Yes, I wish I had started running earlier, perhaps when I was 30 rather than 50, but it’s the best thing I ever did. I’ve made so many friends, the social life. I’ve been with my partner for 27 years and he supports me in my running. You’ve just run your 200th parkrun. When did you start parkrun? I started parkrun when Colwick started in June 2011. I think there was about 15 of us on that very first run. Chris Jones started it, he was with Sweatshop. He used to come to our club, and then he went off to join other clubs. And he asked our little group, “Would you come over and do the inaugural run?” It was amazing. There’s three of us that started together. We’re all still going. Chris is on her 201st the same as me. I’ve been to different ones, mostly in Nottingham. I’d love to go on a tour round other parkruns. I just love parkrun for the amazing effect it’s had on people’s lives. It’s improved everybody’s health, bringing different people together. Have you been parkrunning every week to get to 200? Almost. It will be my 5th year this year. Obviously I’ve missed some to do races, but not many. I do most of my racing on a Sunday. I’ve done 190 odd parkruns at Colwick. I’ve volunteered over 25 times. I enjoy that as well. The club’s taken over the parkrun two or three times (organised the volunteers and run the parkrun). How many races do you run in a year? Last year I did six half marathons, the full marathon and about twenty 10ks. So you might well be doing 30 races a year? Yes, maybe more. I’ve never counted them all. I’ve been doing Advent running (in January) and I ran 103 miles in the month. In 2015 I did over 700 miles so I was quite pleased with that. I’m just addicted to running. If I’ve had a bad day at work, I just put my shoes on and run round the block. It’s an amazing feeling when you get rid of all your stress. How often do you run in the week? I run four or five times a week, and I do bootcamp on a Thursday as well. That helps with the running. It helps with the core strength, using different muscles for when you’re running, it gives you the strength to keep going. I’ve been doing it for about two and half years, once a week. I also had a personal trainer to help me with my weight loss. I was losing weight with my running but I was still eating the wrong sort of things. I was eating carbs, thinking it was helping my running, but I was eating the wrong carbs. I was eating bread, potatoes. I was really struggling. I lost a stone but it took me three years to lose it. Since I got my personal trainer I’m doing different things and eating more healthily. I’ve lost over two stone now within about two years, so altogether I’ve lost three stone in about four years. My whole life has changed completely since I was 50. So running has led you to make other changes such as building up your strength and changing your diet. That was the Robin Hood Marathon in 2014. I’d got my personal trainer, Rob, then and he was helping me do this. I was filling in the form to do the Half Marathon, and we were talking and I said to him, “Do you think I’d be able to do a full marathon?” And he said, “Karen with your determination, yes, I think you would.” So that’s when I signed up. I thought I’d see how I was on the day. If I’d got halfway and thought, “No I’m not going to do it.” I’d have finished at the half. But I did persevere, and it took me over 5 and a half hours but I did it! When I got to the finish line Rob was there waiting for me and asked if I wanted anything. I said, “Go and get me a cup of tea!” I was absolutely gagging for a cup of tea! How did you find the race? It was hot that year. Did you struggle after mile 20? It was tough. It was really hot. I got to about mile 17 or 18. I’d just come out of Colwick Park and back on to the main road. I had to walk a little bit, I could see one or two people in front of me walking. And then I got to about mile 20, and I thought, “I’m going to go for it again” and then I managed to do the last little bit, slowly but I did manage to finish. There were still quite a few finishing when I got to the finish line. When I see the finish line I sprint. I flew down the last few yards. It was an amazing feeling, I didn’t know whether to laugh cry or what to do. I put in for the London (Marathon) and I managed to get a ballot place to run in 2015. I enjoyed the atmosphere, the support and everything. I saw bits of London, not all of it, I’d got my head down. Too busy concentrating on what I was doing. But I must admit I was a bit disappointed at the end. There’s nothing the other side of the finish line. You go through the finish line, they give you your medal and then you walk down to your family. I did knock about ten minutes off my Robin Hood time. It was about 5.28 on the chip. Do you have plans to run another marathon? Yes, I’m planning to run the Lake Windermere one this year (22nd May). You run the reverse way round the lake. Two of the other girls are doing it as well. I’m training for that now. I’ve been going out with some of the Redhill Road Runners. 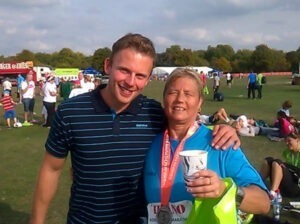 I’m doing longer runs with Wendy (who’s training for London). I did 14 miles the other week. I’m doing Ashby 20. I love Ashby 20, this will be my 3rd time. Just to continue with running as long as I can, and stay healthy. I’m doing the Great North Run again this year. I was looking in to doing an ultra with a friend. The other thing I’d like to try is a triathlon. I love swimming, but it’s the cycling bit I’m bothered about. I’ve not been on a bike for a long while. I have got one. There’s a mini triathlon at Kimberley where you do a 400m swim, 10 mile bike ride and a 5k run. I think I’d be okay to do that one. So I’m looking into doing that either this year or next year. Is there anyone who particularly inspires you? I’d not say inspires me. I’ve had a lot of help over the years. Cathy who started out with us, she’s amazing. It’s her fault I started running! I’ve had help from Rob, my personal trainer, and people such as Wendy (Lawson), and Iris (Peel) of course – she’s achieved so much as well. Has there been anything that’s stopped you running? I had plantar fasciitis at the beginning of 2015. I didn’t think I’d be able to do London. I had to stop running for three weeks and it was the worst three weeks of my life. If I can’t run, I get mardy, but we got it sorted. I had ultrasound and it helped to clear it up. Nothing else apart from that. I had breathing problems when I first started. They said I suffered from asthma. I’ve got inhalers but I don’t use them. I don’t feel as if I need to, so perhaps I’ve got my breathing under control. Losing weight has obviously helped as well. You like race t-shirts and medals don’t you? Yes, I’ve got a collection of t-shirts, and all the medals in cabinets. I save all my numbers. I’ve got almost every one of them for the races I’ve done. I write my time and the date on the back of them and I keep them in a folder. I like raising money by doing sponsored runs. I’m doing the Great North Run for the John Van Geest Cancer Research Centre at Nottingham Trent University. Are there any particular things that you are proud of? I’ve got my medals now, there’s a few more to come yet, but I like to encourage everybody else. If you want to change your life for the better take up running!